great interview..thanks for the giveaway. Your latest series with the Norwegian investigator sounds intriguing – historical fiction, investigator, deaf – so many things going on there to give the main character strife so I can sit back and watch him overcome the obstacles. I fell in love with this series when I read A Woman of Choice. I can’t wait to read the rest of them. Loved the interview. I too fell in love with the characters in Woman of Choice and devoured Prince of Norway and A Matter of Principle. The books and the characters are believable and captivating. I can’t wait to meet Brander in A Discreet Gentleman of Matirmony. 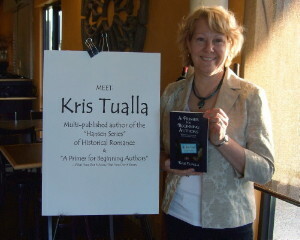 I love historical fiction and Kris Tualla writes a great story! I have never read one of your books but after reading this blog you have peaked my interest. Great interview. Congratulations on the newest publication, Kris! I have not read any of your book yet, but a spy story absolutely on my radar. The blurb of A Discreet Gentleman of Matrimony sounds interesting a historical romance with mystery, and I never read a historical romance book with Norwegian hero it’s surely different from mainstream. looking forward to reading your books and thanks for this giveaway. A Discreet Gentleman of Matrimony sounds great and I love the cover! Thanks, Aline. I should announce the winner of Kris’ book on Sunday.